Some pictures are dominated by a sense of place or environment, yet suggest a narrative. Such images are often put together like puzzles, fitted into abstract two-dimensional arrangements of form. In an exchange with students today, I talked about generating color comps for such pictures as like making miniature abstract paintings. I thought I would revisit an old post from 2010 and freshen it, to give a few examples (even though these samples are decidedly not miniatures, they suggest abstraction) . 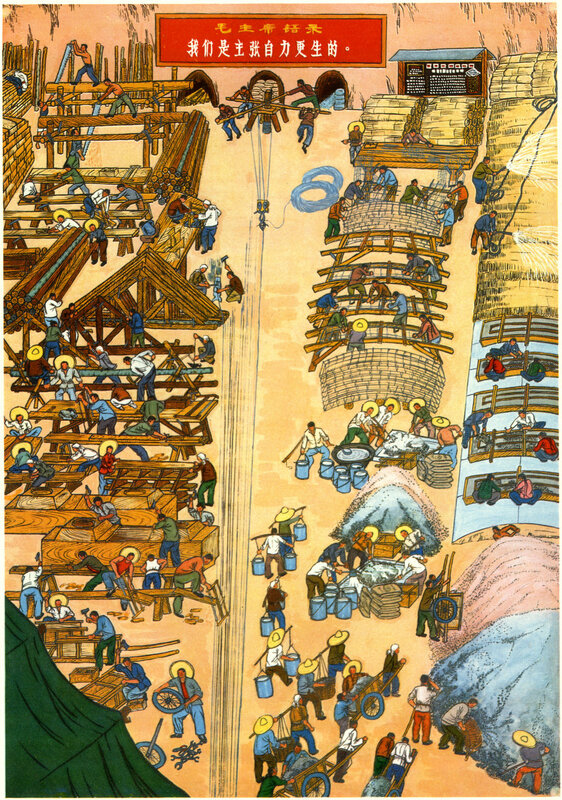 A number of the images shown here are from a book titled Peasant Paintings from Huhsien County. Compiled by the Fine Arts Collection Section of the Cultural Group Under the State Council of the People’s Republic of China. Published by the People’s Fine Art Publishing House, Peking. [Beijing.] 1974. Chinese Sprinkling. Reproduced in Peasant Paintings from Huhsien County. 1974. This book is a compilation of Communist Party propaganda paintings, which are purported in the introductory text to have been produced by agricultural workers who work part-time as artists, “so as never to be separated from...the great revolutionary struggle.” Some of the paintings are unintentionally hilarious, but they are certainly not the work of amateurs. And very many are quite striking. These artists are illustrators. They are required to respond in alignment with a governmental text. And the assignment is pretty tough: make agriculture look wonderful, heroic, well- organized, and really fun. Wayne Thiebaud, San Francisco West Side Ridge, 2001. For our purposes, what's notable is the plasticity of the spaces used to establish environmental information. The flatness of the propaganda paintings shares something with the space-bending San Francisco landscapes of Wayne Thiebaud. Thiebaud has also made farm paintings, like the one shown at the very top of this post. He's also painted freeways, as below. Wayne Thiebaud, Freeway from the Air. N.D. Seeing these images as plans or comps can be helpful for getting beyond the drawing-as-pure-description problem, to make the leap to abstraction, even as your work retains its tether to observed authority. Prefabricated Parts. Reproduced in Peasant Paintings from Huhsien County. 1974. Wayne Thiebaud, Levee Farms, 1998. The Chinese Grasp Revolution. Reproduced in Peasant Paintings from Huhsien County. 1974. The Motor's Roar. Reproduced in Peasant Paintings from Huhsien County. 1974. 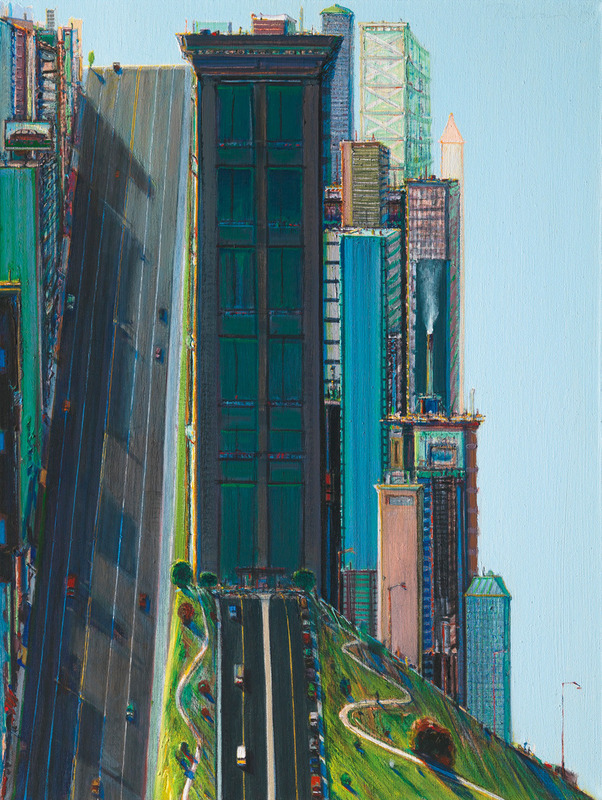 Wayne Thiebaud, Down Penn Street. 1978. 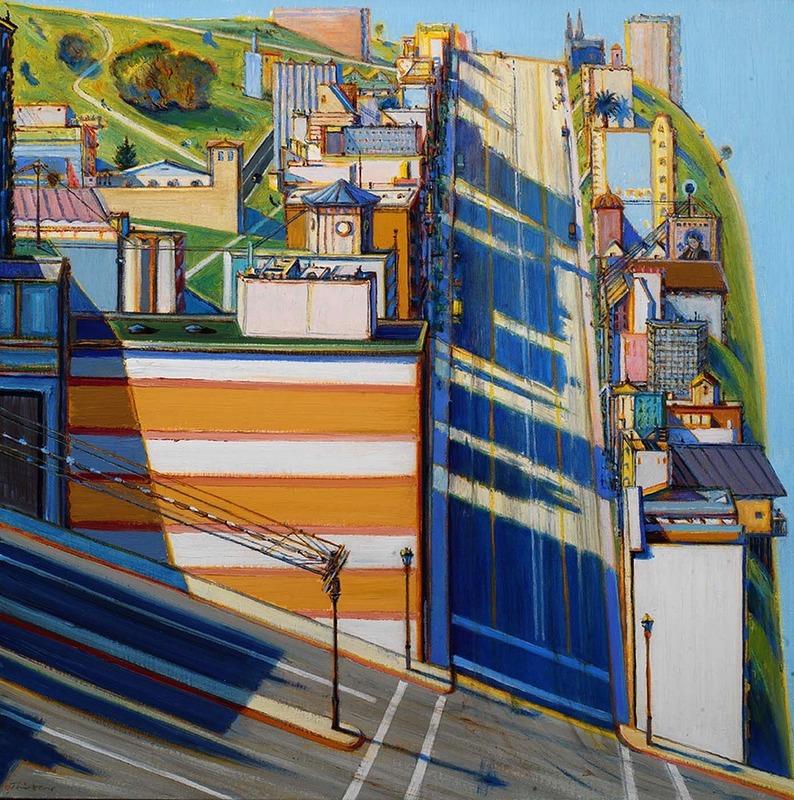 Wayne Thiebaud, Hill Street (Day City) 1981. Foolish Old Men. Reproduced in Peasant Paintings from Huhsien County. 1974.